Mohamed Salah scored twice to reach a half-century of Liverpool goals in a comfortable victory over Red Star Belgrade, as the Reds went top of Champions League Group C.
It was a dominant display from the hosts, Roberto Firmino firing in Andy Robertson's cut-back on 20 minutes. Salah got his first just before the break then added a second to reach an impressive landmark by converting a penalty won by Sadio Mane. Mane then slotted a fourth goal with 10 minutes to go, having missed another penalty just moments before. 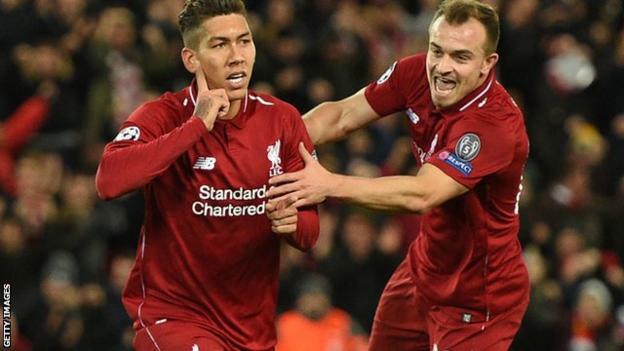 Goalscorers aside, Xherdan Shaqiri proved influential for the hosts - an excellent through ball to Robertson helped set up Firmino's opener and it was the Swiss player's flick that then assisted Salah's first goal. Mane was also bright - he linked up well with Salah on numerous occasions and earned his side's first penalty when he got an arm in the face from Red Star captain Filip Stojkovic. He made up for missing the second penalty - won when El Fardou Ben handled in the area - by sliding in to poke into the bottom corner to make it 4-0, before substitute Adam Lallana was denied a fifth from close range. Red Star, bottom of the group with one point from three games, were banned from selling tickets to supporters for the game at Anfield after incidents during and after their team's play-off round tie away to RB Salzburg on 29 August. Liverpool have not looked quite themselves in recent games - narrowly beating Huddersfield, after draws with Manchester City and Chelsea and a late defeat by Napoli. But they were definitely in the mood in this game and swept aside a Serbian team competing in the Champions League group stages for the first time in over a decade. Summer signing from Stoke Shaqiri was excellent, and his superb through ball to Robertson was vital in the opening goal. He retained his place in the starting XI after picking up the assist against Huddersfield, and set up Salah for the second time in five days with a clever little flick into the box before the break. A ball over the top after 11 minutes was almost put away by Salah too before goalkeeper Milan Borjan reacted quickly to swallow it up. Fabinho, handed his first European start in midfield, showed a glimpse of his ability when he lifted a lovely ball over the top which Trent Alexander-Arnold volleyed into the keeper's hands. And Mane was instrumental in attack after recovering from hand surgery to play with a cast on. Salah's 49th and 50th goal were greeted with roars from the Anfield crowd as the Egyptian reached his half-century in only 65 games for the club. Match ends, Liverpool 4, Crvena Zvezda 0. Second Half ends, Liverpool 4, Crvena Zvezda 0. Attempt saved. Daniel Sturridge (Liverpool) left footed shot from outside the box is saved in the bottom right corner. Assisted by Trent Alexander-Arnold. Attempt missed. Sadio Mané (Liverpool) left footed shot from the left side of the box is close, but misses to the left. Assisted by Roberto Firmino with a through ball. Attempt missed. Richmond Boakye (Crvena Zvezda) header from the centre of the box misses to the left. Assisted by Filip Stojkovic with a cross. Attempt missed. Alberto Moreno (Liverpool) left footed shot from outside the box is high and wide to the right. Assisted by Virgil van Dijk with a headed pass following a corner. Corner, Liverpool. Conceded by Richmond Boakye. Corner, Liverpool. Conceded by Milan Borjan. Attempt missed. Daniel Sturridge (Liverpool) left footed shot from outside the box misses to the right. Assisted by Roberto Firmino. Marko Gobeljic (Crvena Zvezda) is shown the yellow card. Georginio Wijnaldum (Liverpool) wins a free kick on the right wing. Foul by Marko Gobeljic (Crvena Zvezda). Dusan Jovancic (Crvena Zvezda) is shown the yellow card for a bad foul. Roberto Firmino (Liverpool) wins a free kick in the defensive half. Foul by Dusan Jovancic (Crvena Zvezda). Offside, Liverpool. Adam Lallana tries a through ball, but Alberto Moreno is caught offside. Adam Lallana (Liverpool) wins a free kick on the right wing. Substitution, Liverpool. Alberto Moreno replaces Andrew Robertson. Attempt saved. Adam Lallana (Liverpool) right footed shot from the centre of the box is saved in the centre of the goal. Assisted by Daniel Sturridge with a through ball. Dusan Jovancic (Crvena Zvezda) wins a free kick in the defensive half. Substitution, Crvena Zvezda. Veljko Simic replaces El Fardou Ben. Goal! Liverpool 4, Crvena Zvezda 0. Sadio Mané (Liverpool) right footed shot from the centre of the box to the bottom left corner. Assisted by Daniel Sturridge. Nenad Krsticic (Crvena Zvezda) wins a free kick in the defensive half. Attempt missed. Sadio Mané (Liverpool) right footed shot from very close range misses to the right following a set piece situation. Penalty saved! Sadio Mané (Liverpool) fails to capitalise on this great opportunity, right footed shot saved in the top left corner. Penalty conceded by El Fardou Ben (Crvena Zvezda) with a hand ball in the penalty area. Substitution, Crvena Zvezda. Goran Causic replaces Branko Jovicic. Branko Jovicic (Crvena Zvezda) is shown the yellow card for a bad foul. Andrew Robertson (Liverpool) wins a free kick on the left wing. Foul by Branko Jovicic (Crvena Zvezda). Substitution, Liverpool. Daniel Sturridge replaces Mohamed Salah. Richmond Boakye (Crvena Zvezda) wins a free kick on the left wing.